Injuries cannot heal without a constant influx of oxygen, blood’s main ingredient. Engineers at UC Berkeley have developed a new flexible sensor that can map blood-oxygen levels over large areas of skin, organs, and tissue potentially giving doctors a new way to track healing wounds in real time. The sensor, illustrated recently in the journal Proceedings of the National Academy of Sciences, is made of organic electronics printed on bendable plastic that molds to the curves of the body. In contrast to fingertip oximeters, it can sense blood-oxygen levels at nine points in a grid and can be positioned anywhere on the skin. It could possibly be used to map oxygenation of skin grafts, or to look through the skin to track oxygen levels in transplanted organs, the scientists say. Current oximeters use light-emitting diodes (LEDs) to shine red and near-infrared light through the skin in order to detect how much light reaches the other side. Red, oxygen-rich blood absorbs a lot of infrared light, while darker, oxygen-poor blood absorbs more red light. By examining the ratio of transmitted light, the sensors can establish the amount of oxygen in the blood. These oximeters only function on areas of the body that are moderately transparent, like the earlobes or the fingertips, and can only track blood-oxygen levels at a single point in the body. “Thick regions of the body, such as the forehead, arms, and legs, barely pass visible or near-infrared light, which makes measuring oxygenation at these locations really challenging,” Khan said. In 2014, Arias and a team of graduate students demonstrated that printed organic LEDs can be used to develop thin, flexible oximeters for earlobes or fingertips. Since then, they have advanced their work further, finding a way to measure oxygenation in tissue using reflected light instead of transmitted light. Merging the two technologies allowed them to develop the new wearable sensor that can detect blood-oxygen levels at anyplace on the body. 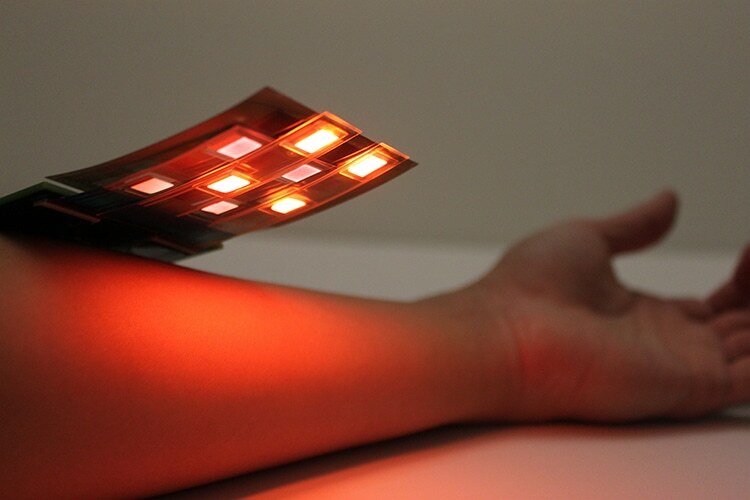 The new sensor is composed of an arrangement of alternating red and near-infrared organic LEDs and organic photodiodes printed on a flexible material. The sensor was used by the team to monitor the overall blood-oxygen levels on the forehead of a volunteer who breathed air with progressively lower concentrations of oxygen—similar to going up in altitude—and learned that it was equivalent to those using a regular fingertip oximeter. The sensor was also used to map blood-oxygen levels in a three-by-three grid on the forearm of a volunteer wearing a pressure cuff. After transplantation, surgeons want to measure that all parts of an organ are getting oxygen. If you have one sensor, you have to move it around to measure oxygenation at different locations. With an array, you can know right away if there is a point that is not healing properly. Yasser Khan, Graduate Student, Electrical Engineering and Computer Cciences, UC Berkeley. The co-authors on this research are Donggeon Han, Adrien Pierre, Jonathan Ting, Xingchun Wang and Claire M. Lochner of UC Berkeley; and Gianluca Bovo, Nir Yaacobi-Gross, Chris Newsome and Richard Wilson of Cambridge Display Technology Limited.